Delivering the first hamper to Tracey Belshaw from Parkmore were Craigavon Mayor Colin McCusker & Jo-Anne Dobson MLA with Portadown Cares Chair Phyllis Abraham and Anna Hurst. Local charity Portadown Cares have launched their Christmas hamper deliveries with the aim of spreading festive cheer to people across the town. The first hamper was delivered by Craigavon Mayor Colin McCusker and Upper Bann MLA Jo-Anne Dobson to Tracey Belshaw from Parkmore and her boys Patrick and Ciaran. Portadown Cares delivered in excess of 120 food hampers and toys to 107 children over the past five days. The hampers, which are valued at £150 each, consist of the basic ingredients to make a meal on Christmas day along with a few extras. They are not luxury hampers, but are filled with the basic essentials, fresh fruit and veg, a voucher for the Meat Cleaver, tea, coffee, sugar, soup, peas, tin foil, sweets, ketchup, brown sauce, cereal, porridge, juice, gravy granules, washing-up liquid, cooking oil, jam, beans, salt, pepper, toilet roll, biscuits, crisps, bread, fruit loaf and cheese. 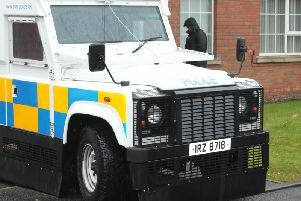 A Portadown Cares spokeswoman said, “We asked the public to donate toys and gifts. Along with this, and a very kind donation from Cool FM’s Cash for Kids, we were able to distribute toys to 107 children, some of whom would have had nothing to open on Christmas morning. Mr McCusker said, “What a wonderful way to help people at Christmastime which can be an especially difficult time for families at the heart of our community. Ulster Unionist MLA Jo-Anne Dobson said, “It is always an honour to join the fantastic volunteers at Portadown Cares to help them deliver hampers across the town. “I have nothing but admiration for the dedicated work they do and also to all the companies and individuals who have stepped forward to help fill the hampers with such wonderful and useful goods.